How much power does the AV32 have? What accessories come with the AV32? Do the AV32 speakers needs to be used with a computer? Can it be brought to other countries and used without the changing the power supply? The audio is cutting in and out, or my speakers or shutting down on their own. What should I do? 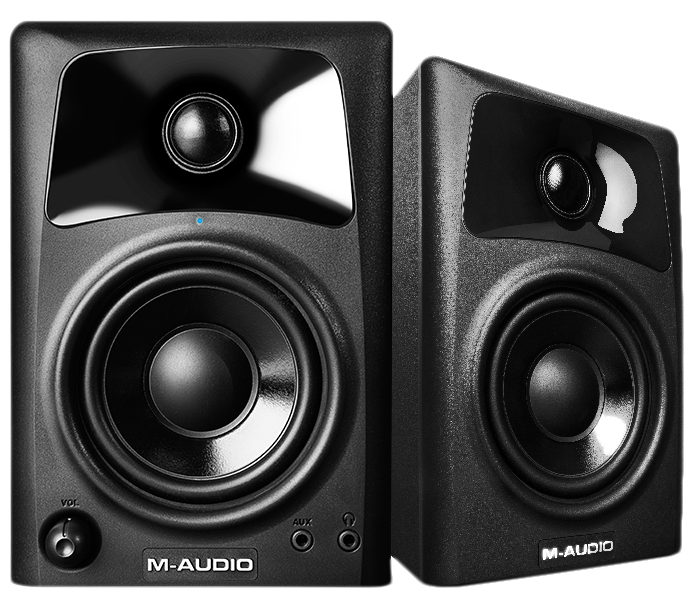 The M-Audio AV32 has a 10-watt per channel amplifier. What accessories come with the AV32 ? The AV32 includes an IEC Power Cable, Speaker Wire, Audio cable (RCA to 1/8” TRS), an additional Audio cable (1/8” TRS to 1/8” TRS), and acoustic pads that can be placed on the bottom of each speaker. Do the AV32 speakers need to be used with a computer? The AV32 speakers have RCA inputs for connecting gaming systems, DJ gear, mixers, computers and more. As long as your device has an RCA output, the M-Audio AV32s will work great! Can it be brought to other countries and used without changing the power supply? The AV32 has an auto-switching power supply. This means they will automatically adapt to the voltage needed for the area that you are in as long as you obtain and use the correct cable to connect to the wall power supply. The AV32 and AV42 speakers feature built-in thermal protection that can help to prevent permanent damage from occurring in the event the speakers are overloaded. When the signal level is too high for the speakers to sustain, the audio will be interrupted, or the speakers may shut down temporarily. Turn the power switch on the rear of the speakers to the OFF position, wait 2 minutes, and turn the speakers back ON. Reduce the signal level by A) turning the volume knob on the front of the speaker down or B) turn the volume down on the external audio source (i.e. your iPhone).